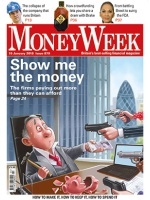 The UK’s best selling financial magazine, MoneyWeek launched in 2000 and has since developed a reputation for independent, consumer focused investment advice. The magazine exists to help you ground your portfolio, keeping your money safe during rough periods and growing in the good times. MoneyWeek will also show you how you can keep more of the money you make, with intelligent, easy to read analysis of the latest financial news and practical tax and investment tips. MoneyWeek Magazine charts the changes in the financial world as they happen, giving you access to top investment strategies, rising-star companies and the best funds and trusts, all from the sharpest minds in Britain. Order your subscription today and start profiting from their advice. The terrible state of bank technology… Bargain Britain – the politics are dysfunctional, but the price is right… Foxconn’s relentless race for profits… Hold on to gold – the yellow metal is the best protection against instability and inflation… The uncertain future of the Commonwealth… Lights, camera, profits – can you really make money from investing in films?… Elon Musk’s magic begins to fade… Order your MoneyWeek subscription today and get the most up to date investing advice from top financial writers every week. MoneyWeek’s core audience is the wealthy investor who wants market leading advice and the latest financial information delivered to their door every week.